Dennis Hastert, C-SPAN "Bruce" video, Patriot Act: Updates on former speaker. 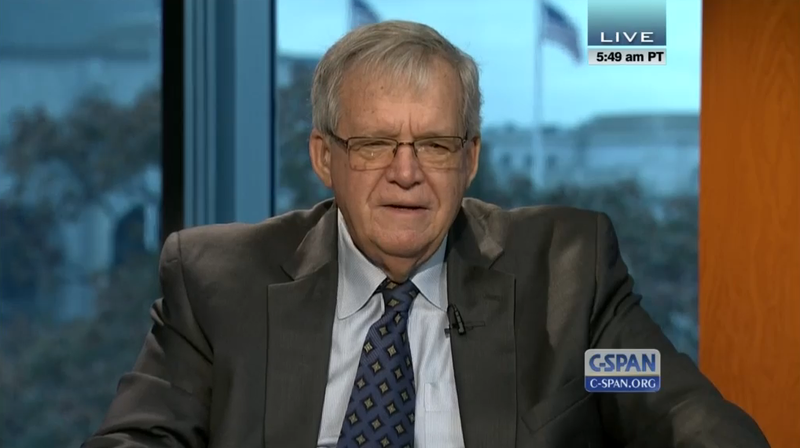 Dennis Hastert during a C-SPAN appearance in November 2014. 1. C-SPAN has flagged and reposted a clip from a November 2014 Hastert appearance in which a caller identified as “Bruce” says, “Remember me from Yorkville?” and laughs unnervingly before hanging up. Hastert was a teacher in Yorkville, Illinois, from 1965 until 1981, and the indictment against him says that the individual who was to receive the $3.5 million is from Yorkville and has known Hastert for most of his or her life. “Individal A” from the indictment, of course, may not be “Bruce” from C-SPAN. The indictment says “Individual A” was in regular contact with Hastert beginning in 2010. 2. The Huffington Post’s Daniel Marans observes that the Patriot Act, which Hastert voted for and helped guide through Congress, may have helped ensnare him. As the IRS notes, “the USA PATRIOT Act of 2001 increased the scope” of cash reporting laws “to help trace funds used for terrorism.” The Bank Secrecy Act of 1970, which was amended by the Patriot Act, had already required banks to report suspicious transactions. The banks that Hastert frequented, the indictment states, were required to “prepare and file with the Financial Crimes Enforcement Network a Currency Transaction Report (Form 104) for any transaction or series of transactions involving currency of more than $10,000.” From 2010 to 2012, Hastert made 15 withdrawals of $50,000 from multiple bank accounts in order to make the hush money payments, according to the indictment. One or more of the banks flagged the transactions as suspicious. The indictment itself is mum on the exact means by which the FBI and IRS found out about Hastert’s transactions, so it’s not certain that provisions in the Patriot Act specifically caused his downfall (vis a vis earlier laws regarding suspicious withdrawls). But Sections 351 and 352 of the Patriot Act mandate and facilitate the kind of bank anti-money laundering programs that could have snared Hastert, while Section 361 amplifies the powers and obligations of the federal Financial Crimes Enforcement Network to track and investigate suspicious activity. In any case, passing the Patriot Act certainly didn’t help Dennis Hastert, and it’s not the only way his past seems to be catching up with him. Correction, May 29, 2015: This post originally misstated that Dennis Hastert had made a $3.5 million payment to “Individual A.” In fact, Hastert is alleged to have agreed to pay Individual A $3.5 million and to have withdrawn $1.7 million from various bank accounts between 2010 and 2014 in order to fulfill that agreement.